In the first part of this series (click to read) we wrote about what winter holds for stone fruit and citrus growers. This week we’re exploring what wintertime on the farm is like for those who bring us greens, tomatoes, squash, berries, and other row crops. What’s Happening in the Fields? For Brandon and Michelle Ross of Ella Bella farm, winter is no time for repose. The harvest may be lean, but the work load is not. What Brandon, Michelle, and a crew of four workers accomplish during the next few months will be critical for the farm’s production, income, and stability in the coming year. An impossibly complicated combination of unknown factors including weather, economy, and urban eating trends require an enormous amount of foresight on the part of farmers who must be both savvy, risk-taking businesspeople and grounded, in-tune, and knowledgeable cultivators. 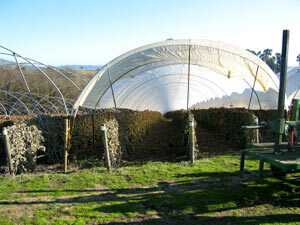 The Ross’s twenty-five acre, two-plot farm in Watsonville is currently in various stages of production and rest. This week, plastic is being laid over raised soil beds where the last wave of strawberries will be planted. The plastic serves to keep the soil warm, and reduce evaporation and weed-growth. Some of last year’s crop of strawberry plants are being pruned and will produce for one more year – something Brandon hasn’t tried before and which could be risky. Generally, strawberries are only allowed to produce for one year and are then removed before the new plants are put into the ground. The older plantings can be breeding places for last season’s pathogens and pests - but the crops are still viable. Hoop houses 18 feet high and 24 feet wide are being constructed over rows of raspberries. These houses, which are covered with white plastic, will keep nighttime temperatures above freezing and protect the plants and soil from rain this winter. In the summertime, the houses can be used to extend the season of heat-loving crops like tomatoes, cucumbers, and peppers. At least half of the farm is now planted in cover crops like bell beans, vetch, oats, and barley. Cover crops are grown to protect and improve soils. This year, Brandon seeded the crops in time for them to form a two-inch canopy before the first rain. The roots of cover crops loosen the soil, improving tilth so that when rains come, instead of forming puddles or eroding rich topsoil, the water infiltrates the earth and is either absorbed by the plants or returns to the water table. Besides improving and maintaining soil aggregation, cover crops impart important nutrients into soils. Plants like bell beans and vetch take nitrogen out of the atmosphere and, with the help of bacteria, turn it into a form usable to plants. For Ella Bella Farm, cover cropping means spending less on expensive organic inputs that would otherwise be needed. Prices for organic soil amendments (such as bone and blood meal) are rising. In early spring, cover crops will be mowed and tilled into the soil as quickly as possible so that the volatile nitrogen does not escape. After the plants decompose for about two weeks, the ground will be ready for tomatoes and other crops. Tomato seeds must be started in the greenhouse by January so they are hardy enough to be transplanted by the end of March after the cover crops are mowed. Other crops will be started in February when the greenhouse will hold what will translate into acres of production. This means that seeds must be ordered and at least a rough map of where and when different crops will be planted must already be made. In between planting, harvesting, pruning, disking, building, planning, and marketing this winter, Brandon and Michelle will repair machinery, and tend to an overwhelming pile of paperwork. To continue selling their produce as ‘organic’ and coming to the farmers market, Ella Bella must renew their organic certification with Monterey County, register organic with the state of California, renew their producer’s certificate with Santa Cruz County, complete applications to farmers’ markets, renew their insurance, and, like all of us, pay taxes. Every small farmer like Brandon or Michelle Ross, on top of producing the foods that sustain and delight us, is also a businessperson occupied in an incredibly important and threatened industry. Brandon and Michelle will be at the market this Saturday with broccoli, cauliflower, leeks, raspberries, syrups, and their one-year old son Harrison.